Switching to the circular use of the four largest materials in terms of emissions is indispensable to cutting global greenhouse gas emissions and achieving the Paris Agreement. A more circular economy could cut EU industrial emissions by more than half by 2050. These are ones of the key findings of a trailblazing report ‘Re-configure: The Circular Economy – a Powerful Force for Climate Mitigation’ commissioned by Finnish Innovation Fund Sitra and the European Climate Foundation (ECF). The study conducted by Material Economics explores a broad range of opportunities for steel, plastics, aluminium, and cement and two large use segments for these materials (passenger cars and buildings). The measures identified could reduce EU industrial emissions by 56 percent (300 Mt) annually by 2050, more than half of what is necessary to achieve net zero emissions. Globally, the reductions could be 3.6 billion tonnes per year in the same period. Industry accounts for 24% of global CO2 emissions, which stood at 37 billion tonnes in 2017. The carbon budget to limit global warming below 2°C has been estimated at 800 billion tonnes by the end of this century. The European Union aims to develop a sustainable, low carbon, resource efficient and competitive economy by transitioning towards a more circular economy. The European Commission is currently preparing a mid-century climate strategy, updating its 2011 ‘Roadmap’ to make it consistent with the new goals of the Paris Agreement. This study outlines the importance of tackling EU industrial emissions in making this strategy a success. “Adoption of new, circular business models based on material reuse and improved efficiency can only bring benefits and give the European companies competitive edge. In parallel, it will lead to significant emission reductions, contributing to our ambitious climate policy targets and improving the quality of life in Europe. Clearly THE winning strategy”, says Jyrki Katainen, Vice-President of the European Commission, responsible for Jobs, Growth, Investment and Competitiveness. The study concludes, there is a growing need for the world to strive for prosperity in new ways. “We are now building a circular economy – a new economic model in which for example consumption is based on using services – sharing, renting and recycling – instead of owning things”, says Mari Pantsar, Director of Carbon-Neutral Economy at Sitra. So far, the focus on reducing industrial emissions have been mainly focused on decarbonising energy intensive processes through increases in renewable energy and energy efficiency. This is not enough. Developing circularity of materials already in use could reduce emissions from heavy industry significantly, the report states. The study points to the mobility and construction value chains as examples of the benefits of a circular economy approach, emphasising the importance of digitalisation to enable new business models. To make a success of modernising Europe’s industrial economy, we must develop an approach that enables all of our industries, including materials-based processing and manufacturing, to innovate now for long-term success. 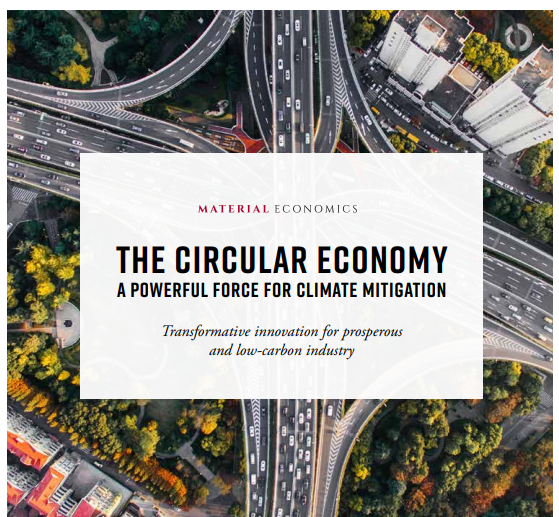 “To ensure the competitiveness of product manufacturers and the reduction of greenhouse gas emissions, stronger incentives to encourage the adoption of circular business models of reuse and sharing platforms are needed”, summarizes Mari Pantsar. Hey Buddy!, I found this information for you: "Ground-breaking analysis finds that the circular economy could make it possible to keep global warming below 2°C". Here is the website link: https://www.duurzaam-ondernemen.nl/ground-breaking-analysis-finds-that-the-circular-economy-could-make-it-possible-to-keep-global-warming-below-2c/. Thank you.